Sewn with strength and attention to detail, this belt is equipped with the proven, quick-release COBRA IDR buckle. 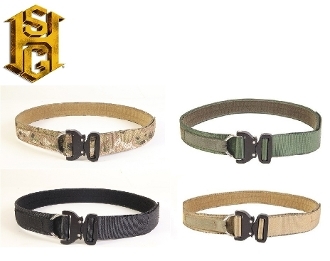 The cobra IDR buckle is the long awaited hybrid of a rigger's belt D-Ring and the proven design of the Cobra buckle. HSGI® Cobra Rigger's Belts are constructed of 2 layers of 1.75" Type 13 webbing sewn together with 5 rows of bonded 138 nylon thread. To provide additional rigidity and stiffness, the layers are laminated with an industrial strength adhesive before sewing. This belt is built to perform. Buckle color is black. HSGI® and A2Z Gear will not be held responsible for any injuries or death for the misuse of any of our products. Made in the USA and covered by HSGI's lifetime warranty.